"When some visitors ask, 'How do the birds know this lake is full? ', I simply tell them that I telephone the migratory birds and inform them," said Ramesh mockingly as he sits at the tip of a lake in south India. Ramesh, 43, who goes by the single name, has been watching over the not-so-famed Vaduvoor lake in Tamil Nadu for 14 years and is witness to the thousands of birds decorating the reservoir's trees. Officially an anti-poaching guard at the Vaduvoor Bird Sanctuary, the strongly-built man is intimately connected to the lake and the birds' species, both native and foreign. Nestled in lush green Thanjavur, formerly Tanjore, region of the southern state -- the delta known as the rice-bowl of Tamil Nadu and granary of south India -- the 316 acre Vaduvoor lake is home to thousands of avian visitors every year from different continents. The lake, situated on the Thanjavur-Mannargudi state highway and surrounded by fertile wetlands, offers a perfect spot for the birds for food, shelter and reproduction when the mercury drops in their home countries in Europe, the Americas and sometimes Russia. The birds' early morning playful chirps are heard from at least a mile away as winged adults train the young ones in flying and frolicking. Most of these visitors are aquatic birds. Two roadside watch-towers provide bird-watchers and photographers with a closer look. Nonetheless, the number of tourists is only minuscule compared to the migratory birds as brisk weekends clock just about 100 people. Most visitors are pilgrims who sojourn the temples dotting the Cauvery river belt. Vaduvoor, more renowned for its Ram temple than the sanctuary, is an unassuming village located 25 km from the quaint and historically rich city of Thanjavur. Years ago, only palmyra palm trees and invasive shrubs surrounded the lake, but authorities and conservationists planted other varieties once Vaduvoor was declared a bird sanctuary in 1999. 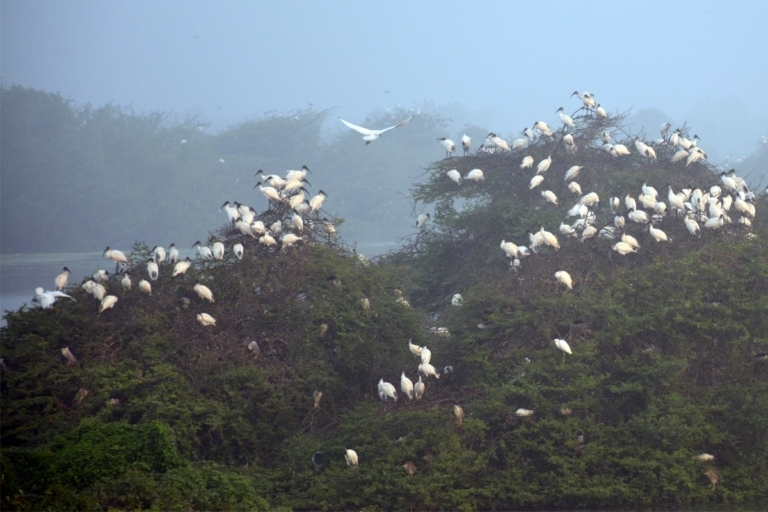 Now, green foliage adorns the reservoir and the lake attracts up to 40,000 birds in peak season, note the forest guards. The entire sanctuary is declared a protected area and the lake is periodically desilted. Ramesh has been observing the sanctuary's metamorphosis over these years and remains confident the facility is only at its adolescence with immense potential to grow. Holding a dainty booklet, which he refused to give away as it was the last copy, containing images and names of birds, he painstakingly explains the characteristics of each species and what it does to the local habitat. His eyes twinkle when he elucidates about a rare species or an unusual pattern in their behaviour. "There is common teal or Eurasian teal [a variety of small ducks] which has now made Vaduvoor its second home. These are intelligent birds," commented Ramesh excitedly, as he mimicked the noises made by some birds. "They usually travel in thousands. They eat young plants and newly sprouted paddy devouring the whole crop. Teals usually leave the lake at 6 pm, raid the crops at night and return at about 4 am. When they leave the sanctuary in the evening, a buzzing sound just fills the entire area," added Ramesh. He went on: "This species is smart enough not to raid crops within a radius of 30 km to avoid getting caught. These birds only attack the crops beyond that." No less than 40 species of birds, both indigenous and foreign, are routinely spotted at the sanctuary. In total, 138 different species of birds have been observed on various occasions at Vaduvoor, which include the little grebe, Eurasian spoonbill, varieties of herons, Indian shag, darter, ibis, different breeds of kingfisher, teals, ducks, northern pintail, Eurasian wigeon, northern shoveller, garganey, coots, moorhens, lapwings, spot-billed and Siberian pelicans, jacanas, black-winged stilt, red/green shank, little stint, Brahminy kite, terns, plovers, sandpipers, cormorant, varieties of egret, painted and open-billed storks. Even, greater flamingos are seen, albeit rarely, especially when the water level reduces in March, allowing the birds to fish freely. Still, only 10 or 15 of these flamboyant birds are spotted, say locals. Some new species such as megabats, also known as fruit bats and considered a delicacy locally, have been observed with an increased presence in the past three years. Their numbers have grown in recent years, thanks to boosted conservation efforts, locals say. About 2,000 megabats, which are usually large in size, exist around the sanctuary and have now begun to make the region their new home for their next generation. In the initial years, migratory birds stayed for just three weeks but their stopover period has constantly expanded over these years. The sanctuary bore the brunt of cyclonic storm Gaja, which wreaked havoc in Tamil Nadu's delta region in November. A senior forest department officer, widely considered as the man behind raising the profile of the Vaduvoor sanctuary, said more needs to be done in terms of conservation efforts. The authority, who did not want to be identified, said the local villages should be more enthusiastic about the sanctuary's existence casting aside the prevailing apathy. The Tamil Nadu Forest Department, which is responsible for the Vaduvoor sanctuary, hopes to steadily refine the facilities available at the birds' haven to attract eyeballs and boost research options. With Rs 1.7 million allocated by the Tamil Nadu Government to upgrading the facility and more funds in the pipeline, authorities are to set up solar lamps, more viewing points and other amenities. The existing walkway of about a kilometre is to be extended as officials expect to lay pavement eventually along the entire perimeter of the lake. "Not everybody knows the significant role of wetlands. Our idea is to expand the overall study of wetlands and its ecosystem spreading awareness," said S. Ramasubramanian, conservator of forests for the Thanjavur circle, who oversees forest areas in the region. "There are many indirect benefits of having a sanctuary such as water conservation efforts and raising awareness about unwanted weeds." "Ecologically, the lake has improved a lot due to the arrival of birds. There is a complex but silent revolution taking place here in terms of ecosystem," said Ramasubramanian.